Whether it’s to escape an American bombing raid, or for an awesome adventure through Vietnam then the Minsk is the perfect getaway bike. “There’s only one bike to tour Vietnam on, the Minsk. In Vietnam the Minsk rules supreme,” said a member of Hanoi's Minsk Motorcycle Club. Kaitaia-based Adventure Ride organizer Britton Adventures is taking a group of Kiwis on a tour of Vietnam in August and like the club the Minsk is the company’s machine of choice. “The Minsk is the only remaining Eastern Bloc 1950’s designed two-stroke on/off road bike still in production on the planet. It is designed for difficult tracks, forest paths, mountain inclines, and for where there aren’t any roads at all. Minsks are imported into Vietnam as farm machinery, not vehicles, and form the backbone of the nation’s rural economy. They’re a beast that will get you where you want to go. No wonder the Vietnamese call it, “con trau gia” (old buffalo),” said one Minsk Club member. 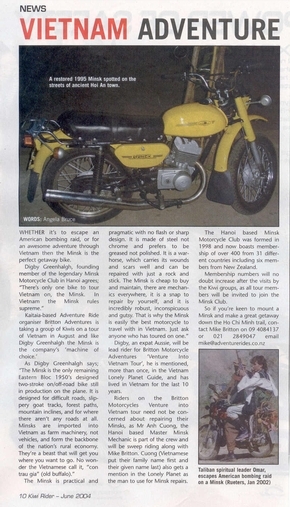 A Minsk Club member will be lead rider for Britton Motorcycle Adventures ‘Venture into Vietnam Tour’. Riders on the Britton Motorcycles Venture into Vietnam need not be concerned about repairing their Minsk, as Mr. Cuong, the Hanoi based Master Minsk mechanic is part of the crew and will sweep riding along with Mile Britton. Cuong also gets a mention in the Lonely Planet as the man to use for Minsk repairs. The Hanoi based Minsk Motorcycle Club was formed in 1998 and now boasts membership of over 400 from 31 different countries including six members from New Zealand. Membership numbers will no doubt increase after the visits by the Kiwi groups, as all tour members will be invited to join the Minsk Club.